When I was a little girl, my mother, sister, and I used to put together puzzles. This tradition usually occurred in the winter over an old blue card table while my mother drank coffee. My mom showed my sister and I how to put together the edges then focus in on a specific color in the puzzle. I often wanted to put the wrong pieces in spaces and somehow would always force a piece in and say, “Look, I found one!” My mom would smile, remove my misplaced puzzle piece, and some how find the correct place to put it in the puzzle. In the end, there was always a sense of pride when the very last puzzle piece was placed in its spot. The puzzle was clear, you understood it. 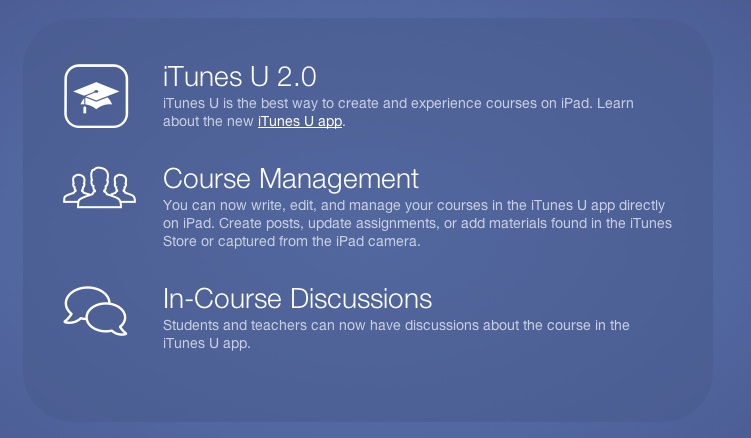 iTunesU courses are the newest puzzle I put together. iTunesU is a really easy program to work with. Teachers can search for iTunesU courses and use some that have already been made by other educators (Did you notice that?!?! These are made by educators NOT companies! ), or they can create their own using the Course Management System. It is clear to me and others that iTunesU is one of the next steps in tech integration. Teachers already have access to files and media they have used over the years to teach a specific standard, and iTunesU is a way to put together all of these files. Anyone that has access to an iPad, including students, can then load the course onto their iPad and begin learning. Below I have placed a very basic slideshow that outlines how to create a course (this was created after the most recent update). After students access and download a course onto their iPads, you can really begin to differentiate inside of your classroom. Those high fliers that do not struggle with comprehension? Allow them to create a small group and complete the course together. Those that need a little bit of assistance? Allow them to choose a buddy who can really help them complete the course successfully. Those students that you know have IEPs, 504s, or truly need additional support? Create a small group, and lead them through the course. Now, you can provide more personalized instruction and the groups can change based on student needs. How students learn is evolving. iTunesU allows teachers to teach the way students attain knowledge, and provides a platform to create an environment in classrooms that fosters an effective way to learn. Below are the web links to three courses I have created in the last week and a half. Feel free to use them in your classrooms.